Institute manager Kevin Deery didn’t quite get the birthday present he wanted at today’s Tennent’s Irish Cup fifth round draw. The Waterside men will meet Ballyclare Comrades for the third time this season and Deery is hoping it’s a case of third time lucky at Dixon Park, on Saturday January 7, 2017. We have a good enough side and we want to showcase what we have got in the North West. Having already drawn twice this campaign, most recently at Drumahoe last weekend, Deery believes his side can progress. “Yes in any cup competition you always want a home tie and then take your chances from there, but unfortunately we go away to Ballyclare, but I do feel it’s a tie that we can win,” he said. “I feel excited about the tie, because we played some great football at their ground earlier in the season and we were unfortunate not to win the game. “Hopefully we can replica that type of performance and maybe try a different game plan, which will hopefully get us through to the next round. “Our game at the weekend was a very good advert for our league because both sets of players deserve credit, because no disrespect a lot football in this country isn’t geared towards the intensity we played at last Saturday. While Trojans, who have reached the fifth round for the first time ever, also take on a Championship side as they face on Armagh City, Holm Park. For boss Paul Higgins he wasn’t too disappointed that his didn’t get one of the big boys. “We are happy enough with the draw,” said Higgins. “Yes we probably would have wanted the glamour tie but it wasn’t to be. “But it will be a good day out for us and we’ll treat them with a lot of respect, we’ll do our homework and hopefully we can progress. “We have a good enough side and we want to showcase what we have got in the North West. Higgins also confirmed that he expects Deery & Co to help him out with any information on the Holm men. 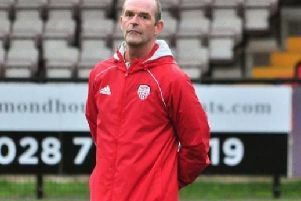 “Kevin Deery was Trojans manager before moving to Stute, so both clubs have good links. “Yes we’ll have a chat about Armagh tie.